Definition at line 34 of file DJITxtParser.cpp. Definition at line 41 of file DJITxtParser.cpp. Referenced by RecordAndDetailsParser::note2ByteDateField(), and RecordAndDetailsParser::note2ByteField(). Definition at line 29 of file DJITxtParser.cpp. Referenced by RecordAndDetailsParser::note3ByteVersionField(), RecordAndDetailsParser::noteByteField(), RecordAndDetailsParser::parseRecord(), RecordAndDetailsParser::parseRecord_DEFORM(), RecordAndDetailsParser::parseRecord_GIMBAL(), RecordAndDetailsParser::parseRecord_HOME(), RecordAndDetailsParser::parseRecord_OSD(), RecordAndDetailsParser::parseRecord_RC(), and RecordAndDetailsParser::parseRecord_SMART_BATTERY(). Definition at line 48 of file DJITxtParser.cpp. Definition at line 55 of file DJITxtParser.cpp. Referenced by getWord64LE(), RecordAndDetailsParser::note4ByteField(), and RecordAndDetailsParser::note4ByteFloatField(). Definition at line 62 of file DJITxtParser.cpp. Referenced by main(), RecordAndDetailsParser::note8ByteDoubleField(), RecordAndDetailsParser::note8ByteLatitudeOrLongitudeFieldInDegrees(), RecordAndDetailsParser::note8ByteLatitudeOrLongitudeFieldInRadians(), and RecordAndDetailsParser::note8ByteTimestampField(). Definition at line 83 of file DJITxtParser.cpp. 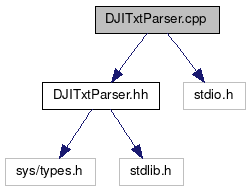 Definition at line 68 of file DJITxtParser.cpp.